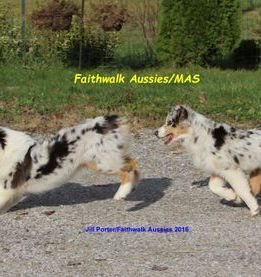 I thought I'd write up a bit of an "introduction" to Aussies, for a prospective puppy buyer to read through and try to really understand, before buying their first Aussie. There is plenty of information out there about the history of the breed and its working talent, and I don't want to try to replicate all that here. I mostly want to talk about what it means to live with this breed, from my perspective and first hand experience. 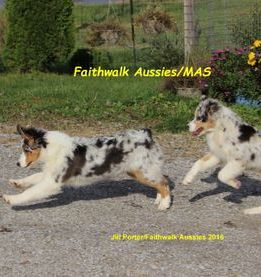 I am writing this mostly from the perspective of keeping an Aussie as a companion, not trying to give detailed information on choosing a stock dog, agility partner and such as you can find that information elsewhere. There are other sites with that information, but I want to give you insight into day to day life with this breed. There is a tremendous variation in this breed, and lines bred more for one purpose or another (working versus show, for example) may display some variety in those traits. I am writing from what I have experienced in my own dogs, and of those I have fostered or known in my years in the breed. First let me talk a little about the breed's history and development. They were created to work stock on ranches out west, mostly as cattle dogs, but also often made good watch dogs, and sometimes even varmint dogs (keeping animals out of the family's livestock.) As such they can be tough, gritty dogs who have a strong instinct to guard and protect, and most want a job or purpose. If this is something you want, it's a good thing, but it can also get a family pet in trouble if not well managed, especially in a city or suburban setting. 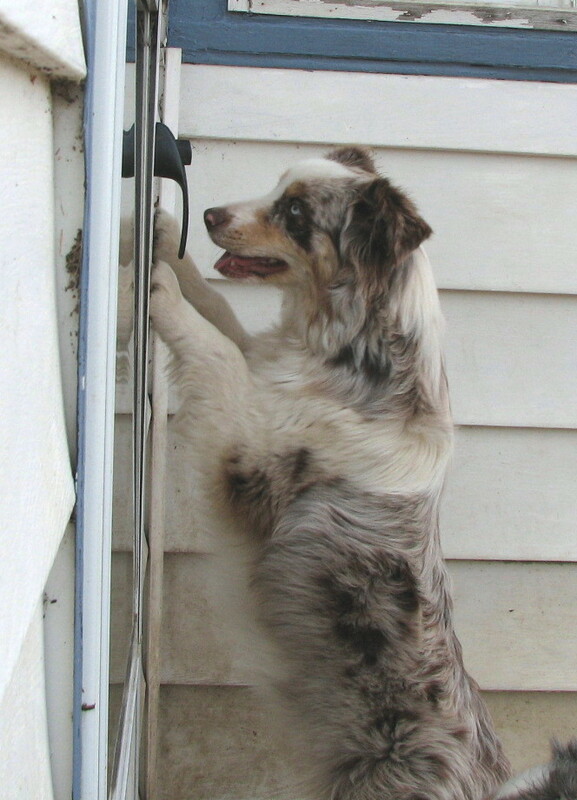 The breed standard even calls for Aussies to have strong working and guardian instinct, and to be reserved with strangers, something not seen in most breed standards for other breeds of dogs. What does guardian instinct mean? What about reserved with strangers? It may mean different things to different people, and of course it will vary from Aussie to Aussie. Reserved with strangers is not shy, reactive or aggressive. It is simply a calm confident dog who chooses not to foolishly rush up to a person he doesn't know and fawn all over them. He is a thinking dog, accurately discerning friend from foe and has a stable, thoughtful temperament. It also may mean your dog may not willingly enjoy or even accept a lot of handling from strangers, and it may become overly protective if not well socialized and managed from puppyhood on. I have had dogs of various breeds all my life and I find that many Aussies take a LOT more early socializing to a wide variety of people to help them learn to be civil, if not happy, to be petted or handled by strangers. The more people they meet the more they can learn to discern friend from foe. Some Aussies learn to be very happy to be petted or cuddled by visitors, while others are civil to friendly strangers, but not overly affectionate. That's okay for this breed, but it's something a prospective owner needs to think honestly about. Many people want a dog who does like all people, and not all Aussies will, even if they are "well bred" and well trained and socialized. 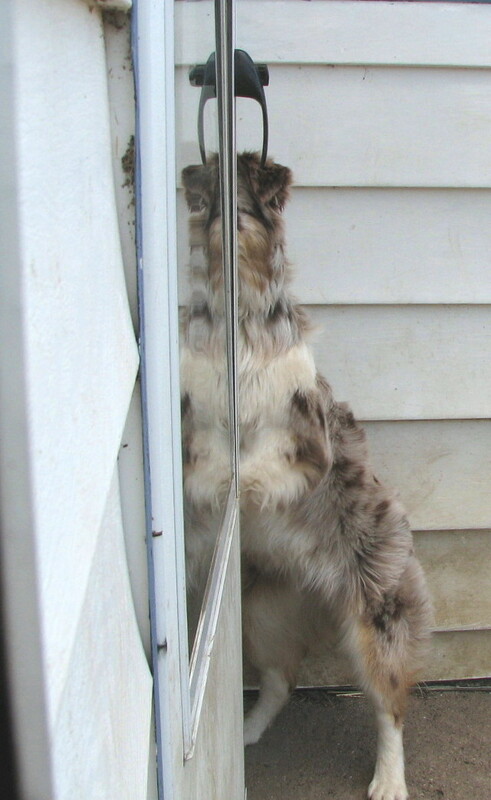 If this would be a problem, you may want to pass on getting an Aussie. On the other hand, some Aussies are more naturally outgoing, and you may find both kinds in the same litter. I have even met Aussies who don't know a stranger, though it's not something to count on in the breed. 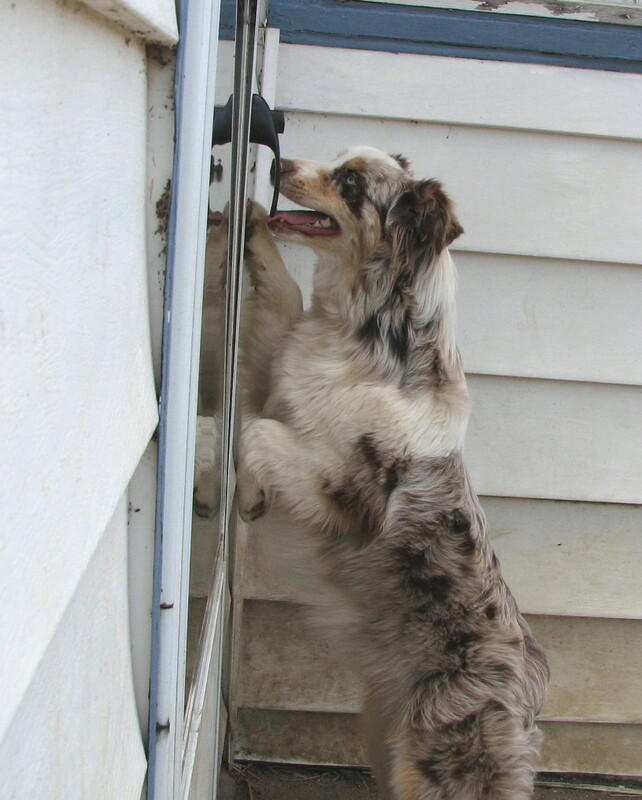 An Aussie owner must also do his or her part in learning about dog behavior and understanding how an Aussie thinks, so as to help the dog become the best he or she can. 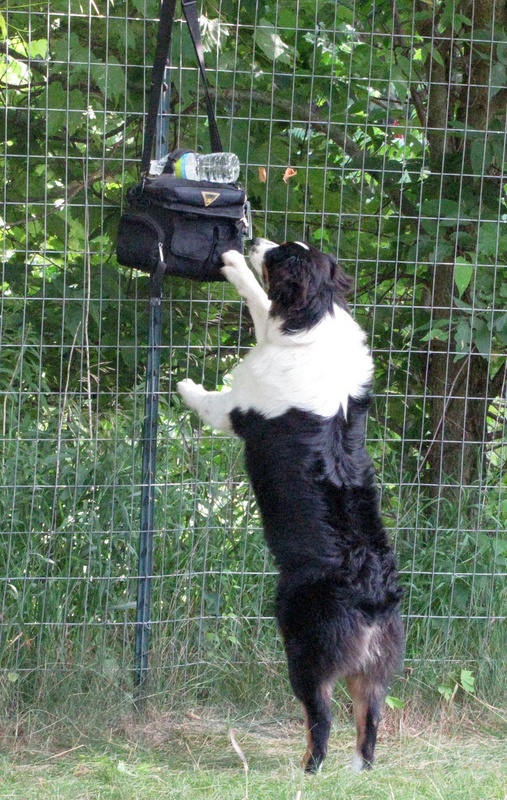 Being able to read your dog's behavioral clues is vital to doing the best by your dog. With proper training your dog can be safe and civil, and to be comfortable in a variety of situations. But, there may be times or situations you need to remove the dog from the situation, or carefully manage interactions to keep everyone safe and happy. You can then work on helping your dog react in a more appropriate manner, in a controlled training situation. An example may be if you are out in public with your dog, and a crowd of people suddenly swarms your dog to pet him. Any dog may feel cornered or overwhelmed by that, and if you can read your dog's comfort level, you will know if it's appropriate to ask the people to back off and give the dog space, allowing him to approach if he chooses. If the people aren't willing to respect this request, politely remove yourself and the dog, rather than forcing him to endure a situation that may cause him to react in a way you don't want, and lose his trust in you to keep him from situations that he is not equipped to handle. Then you can continue to work on helping the dog to feel comfortable in such situations, if that is your goal. Also consider that not all dogs will like all people, any more than you would. You can learn to be polite but it doesn't mean you want all strangers to invade your personal space. Don't force your dog to accept a person he doesn't want to. Aussies will follow a sensible, strong leader. I think as stock dogs (mainly cattle) they had to have a certain toughness and grit to have the presence to make cattle respect them. That can translate into a pet that also has that grit, and isn't suitable for an overly soft natured owner who wants an "easy" dog. I also don't advocate harsh handling, but firm, fair leadership that makes sense to the dog. Dogs are pack animals and understand a hierarchy, but won't want to follow a dictator or a wimp. Aussies are also a thinking dog and putting their brains to work gives an outlet for their abilities. Another issue I see come up is that an Aussie bonds very strongly with it's family. If there are children in the family, you must take extra steps to help socializing and supervise the puppy with your children's friends. They may take normal play and rough housing as a threat to your children, and act to protect them. They may become overly protective of your home, yard or car if not well trained, socialized and managed. If you aren't a good leader, an Aussie may take over and that can also cause problems in many areas. 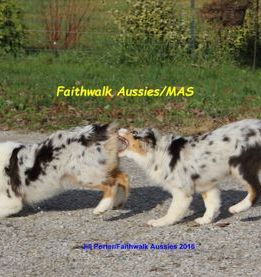 This is all normal Aussie behavior (and dog behavior in general) and if it could become a problem or you aren't willing to train through it, it may be best to rethink the choice of this breed. On the plus side, I find Aussies to be willing partners and protectors, who thrive on close human contact and leadership. They are beautiful and athletic. I love how they want to be with me and try to help in all I do. They learn fast, are extremely loyal and athletic, and for the right owner, they are a wonderful breed to share one's life with. They do best in a home with plenty of human contact, consistent and educated leadership, plenty of exercise, and ideally a job to do, even if it's not traditional livestock work. I don't think they are a good choice for a casual dog owner, but for a dedicated, savvy dog owner an Aussie can become the dog of a lifetime! Here is an excerpt from a conversation from someone who knows this breed and canine behavior quite well. It is used with her permission. I strongly recommend anyone considering an Aussie read this and understand it.
" You can't force a dog to herd if they have no herding instinct and you can't force a dog to be social if they have strong guardian instincts and bred to be reserved. Remember that the Aussie is not by definition a social breed. 'Reserved with strangers' is part of the breed standard. And although I get arguments when I say the breed can carry a lot of anxiety, I feel it does, but this is one of the reasons they're so hyper aware of environment and being reactive to it. It's why we hear stories of people saved from a charging bull or other livestock because their Aussie stepped in to stop the animal. They are bred to be hyper aware. But sometimes they need intervention from us so they don't need to feel they need to control the situation. What looks like being overly protective is often feeling as though nobody else is in control so they feel the need to do so. I highly recommend teaching the dogs that we worry about what's going on so they don't have to. That we are in control. Yes some Aussies are social, but it's individual and this discussion isn't about those dogs. I do believe that this breed needs to be over socialized, more so than other breeds, but it's still no guarantee an individual dog will end up liking being put in social situations. 'Reserved' is the opposite of social, so I'm not sure why we feel we need to force our dogs to be social. We can't turn them into something they're not. " This little article is something I wrote in response to a discussion on a Facebook Aussie group. I wanted to write up something that will help shed some insight into the topic. 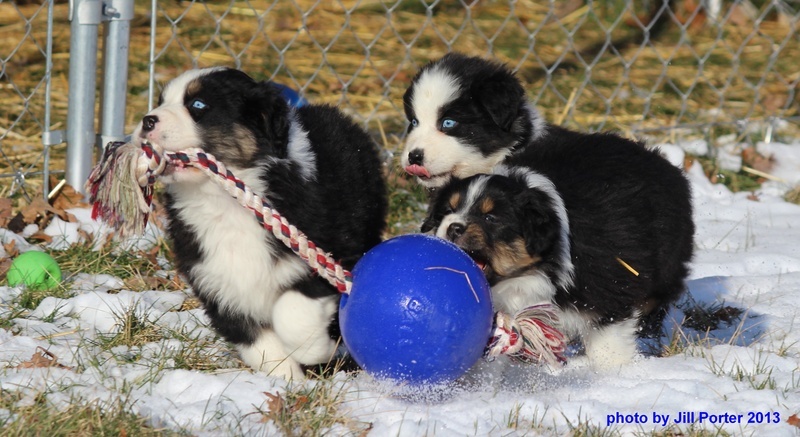 There is SO much misinformation and misunderstanding on this topic in herding breed dogs. Dogs are often punished or harshly corrected with little or no understanding on the owner's part, or worse yet a "trainer". To start with, dogs are predators and chase down their prey (cursorial hunters.) Not that they don't scavenge too, but they can and do chase down prey, all canids do. That gives us the basis for many behaviors in our dog breeds. And just being a dog means they have an instinct to chase things than move. Even playing fetch is based in prey drive. Herding drive is simply modified prey drive. In wolves or any canid, the whole sequence is to see (give eye), stalk, chase, bite, pull down, kill, eat. In herding we hope, by selective breeding, to make the sequence stop before the pull down, kill and eat part, and that biting is not overly damaging to the livestock. Because there is no "gene" that controls this we can't just make it happen through selective breeding so that we get EXACTLY the level we want. So many herding breed individuals do go too far, or are too intense in that area, just as there are some individuals who don't much herding drive at all.. 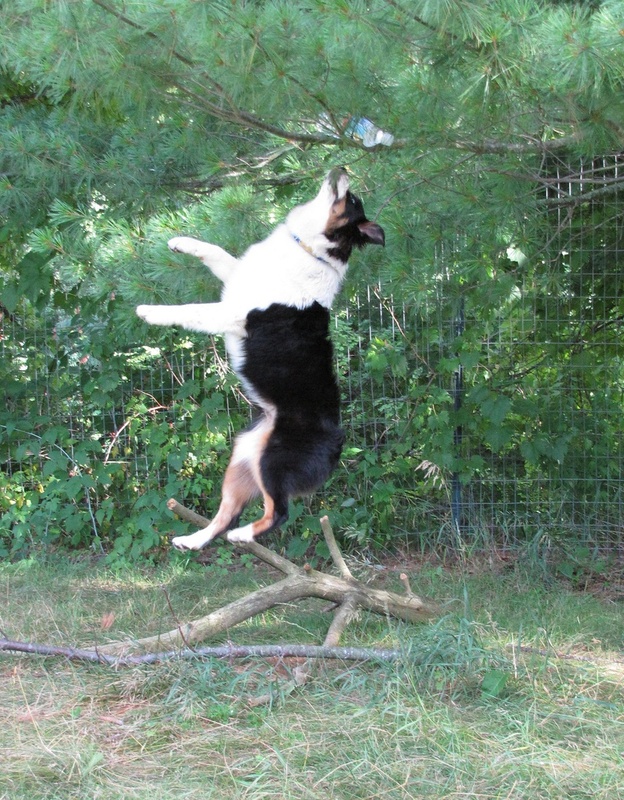 Since herding breed dogs have been selected for a higher interest in movement, and an urge to control it, some also get too intense in that area. This is controlled by their genetic instincts. We can mitigate some by how we raise they but such dogs are wired this way. Understanding all that not only gives us more insight into how they think and WHY they do what they do, but hopefully removes the judgement or emotion of "he's doing it to be bad, dominant, etc" because then some people get mad at the dog. And it has NOTHING to do with dominance which is strictly related to social behavior, and prey drive is not related to social behavior. The dog is not waking up in the morning planning to chase and bite things that move, he is simply reacting in a way his genes tell him to. He does not think people or other dogs are sheep or cattle, but they trigger those instincts and reflexes to chase and bite. In the photos I included above you can see one pup chasing the bottle and the other pup is chasing her. It's all good fun for these girls, but shows how they think. Because Aussies have been bred to be very detail oriented, to notice subtle things we may miss, and to be the type to take charge and try to detail with those details, they can also have "too much" of these traits. They can be overly anxious, overly reactive, overly sensitive, hyper vigilant and so on. Added to that strong prey drive we call herding drive, on top of being cursorial predators, you can see why this is a common behavior in herding breed dogs. I really try to get people to understand why these breeds have these traits, since knowing how to help them begins with accurate understanding. Another topic that many people confuse with this is fear based aggression. A dog that is fearful and reactive may rush up and bite someone from behind. This is also not herding drive, this is a dog trying to make the "scary thing" go away. Knowing why the dog behaves in that manner in that situation is equally important. Correcting a fearful dog will definitely make it worse. Being able to understand the contexts and reasons for these behaviors is so important, and I really want people to take the time to learn how to read canine behavior and see how their dogs view the world. It is often so different than how we do. Just how smart is an Aussie? Here is a cool series of photos showing the problem solving skills of an Aussie. 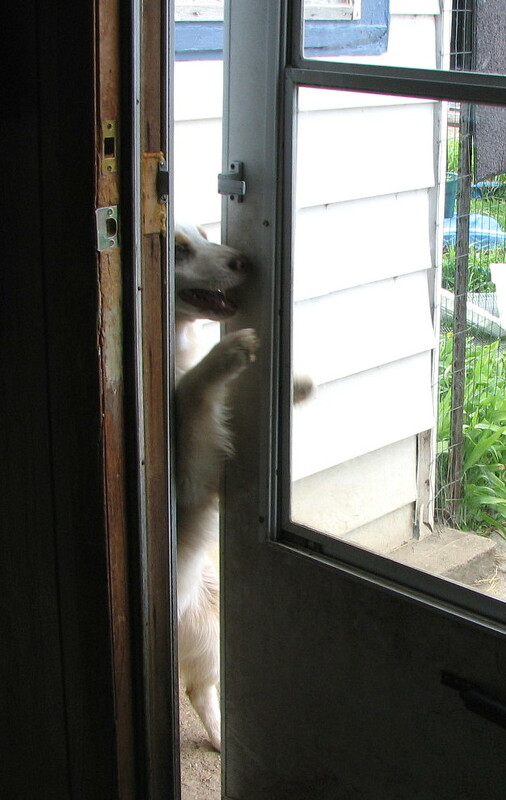 The photos aren't great but I just had to take them, to show this dog figuring out how to open the back door. You can just see her working to figure out how to do this. She was new to this yard and door, but had let herself in a few times. I was determined to see how she did it. She wouldn't do it if she thought you were watching. In the first two photos, she's looking at the handle and beginning to use her mouth to open the handle. In the second set she's got it partly opened, and then is coming in. This whole thing only took about a minute for her to accomplish. 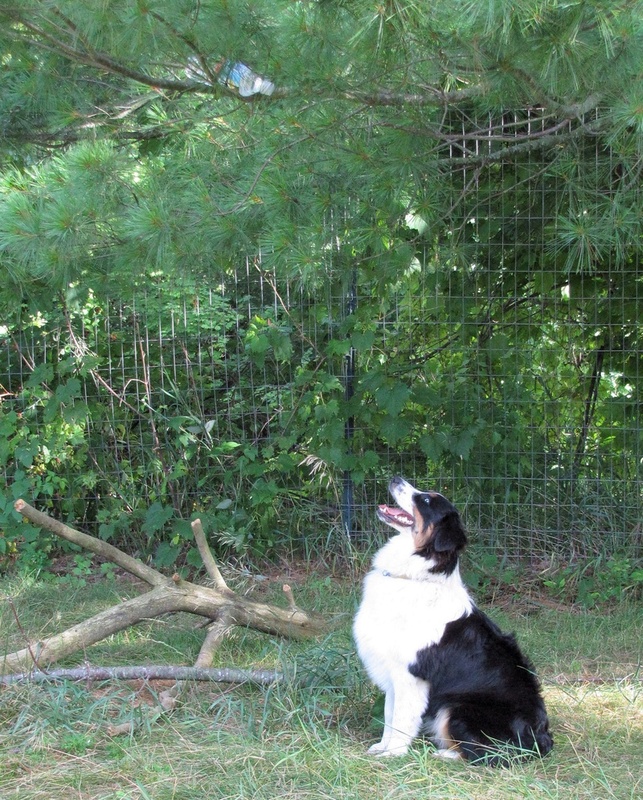 Make sure if you get an Aussie, you want a dog with such good problem solving skills! 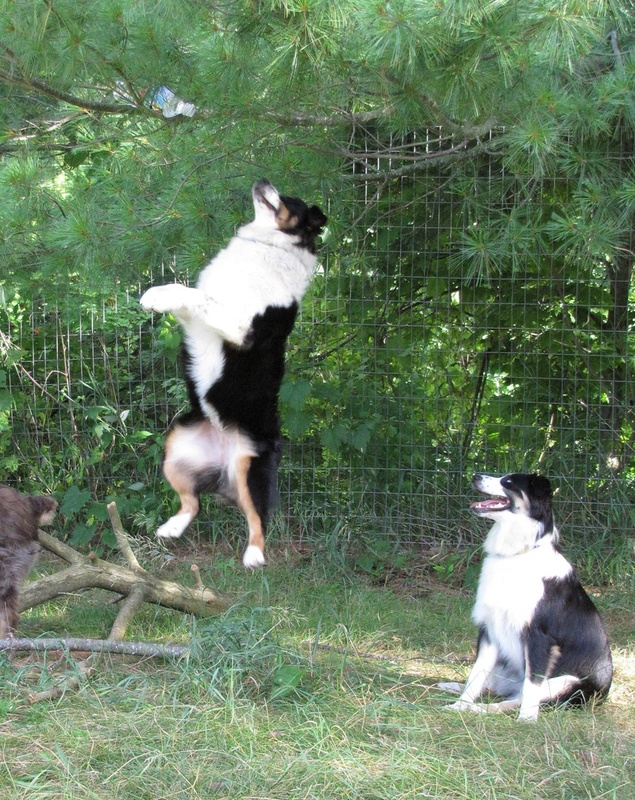 In this fun series of pictures above Skye, a young female saw my husband put his water bottle in the tree (to keep it out of reach of the young pups.) I KNEW she'd try to jump up and get it, it's just how dogs of her lines think. It was about 7 feet up in the air too. So I aimed my camera and waited. As soon as he walked away, she sat and contemplated the situation. Then she jumped up a couple times, realized she couldn't reach it and walked away. She knew MY water bottle was on my camera case hanging on the fence and walked over to it. She could have reached it but I think she knows if I put something up there, it's not to be touched. Later, to test her, my husband put the bottle in a different, higher spot. She didn't even try. He put it back in the same spot and she didn't try there, since she'd already learned it was just a little too high. Some of these Aussies are so smart it's uncanny. Some dogs will try and try and try, others don't even think to try. My Aussies try, if it doesn't work they don't waste their time or energy. I love that about them. You can just see them thinking it out. Having such an intelligent dog is great, but if bored they can be very creatively naughty! So be sure you want a thinking dog before getting an Aussie. "For God so loved the world, that He gave His only begotten, Son, that whoever believes in Him should not perish, but have eternal life."